A commonly asked question what height and distance to the oche should a dartboard be? The detail below covers the Standard (steel tip) Dartboard or in some quarters called the London Board. The setup can vary for other Regional dartoards i.e. the Yorkshire Dartboard, the Fives Dartboard and the smaller Manchester Dartboard. These dartboards can have either different board height or oche throwing distances. 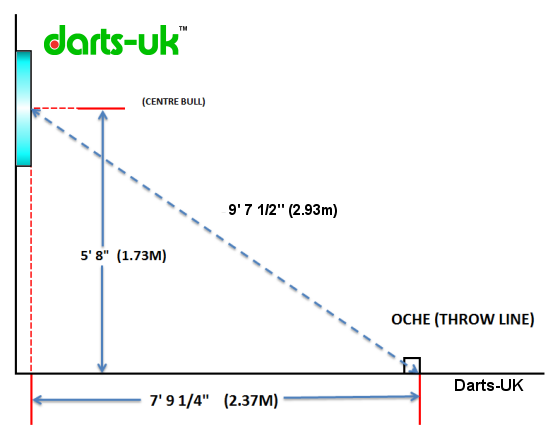 With Soft-tip Standard Dartboard the reconised throwing distance is 8' (2.43m) not 7' 9 ¼” (2.37m) as shown below. See regional dartboard section. Soft-tip Dartboard setup details are also shown here however I have not included a diagram. This website contains both metric and imperial measurements to set-up the standard ‘clock’ or ‘London’ dartboard. Throws of you with a keen eye will know that the 5’8” is in fact 172.72cm not 173cm as illustrated so what should the height be? The height since the formalisation of the both height and throwing distance should be as show 173cm height and 237cm length. The imperial measure for the height was rounded up by 0.28cm a very slight change however other regional dartboard height is still referred to in the older imperial measurement but you will see I have also added the metric equivalent. 7' 9 ¼” (2.37m) from the board to the throw line or 9' 7 ½" (2.93m) when measured diagonally from the bulls eye to the throwing line). This second measure is used when playing on an uneven surface. Minimum 2' (0.6m) clearance both sides of the board (remember darts are sharp!). The common oche length used when playing on a Soft-tip boards is 8’ (2.43m) not 7’ 9 ¼” (2.37m). See your local league for any variation. The height of the board is the same as a standard dartboard. A commonly asked question is what distance should ladies throw from. Well basically BDO World Championship ladies throwing distance is the same as the men's, 7' 9 ¼” (2.37m). But many leagues around the UK have different throwing distances for ladies. The most common distances other than 7' 9 ¼”, is 7' 6" & 7' 0". Other distances for men include 8' 0" & 8' 6" but this is now uncommon. 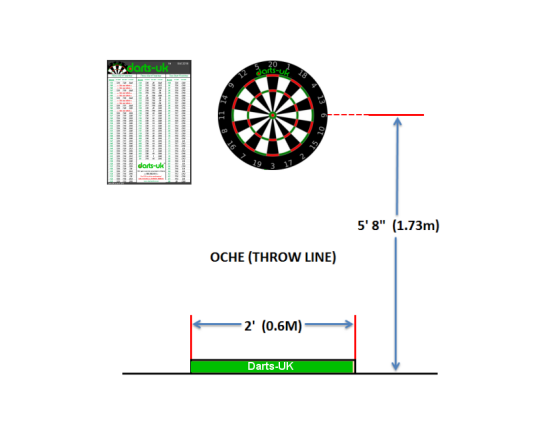 Why is the Hockey / Oche and dartboard height such an issue? Scholars of the sport may have read there have been, and still are, many variations of the dartboard. The common dartboard we see on TV and probably play-on in pubs and clubs is known as the standard London clock dartboard but it hasn’t always been that way. For this reason confusion set in on what the setup for a dartboard should be, above in the is Official setup for the standard board but what about others? Throwing distances and heights have varied over the years and today different leagues still use different measurements. I have listed below the standard measurements used. However I am sure others will say we play from x distance different from what I have stated. I know some ladies leagues do use shorter throwing distances but this is not true for official competition i.e. WDF,BDO competitions. The standard dartboard setup is used by the WDF, BDO, PDC and other official bodies. As for the others, I have checked with the regions, to confirm the setups for each. The figures here are rounded to the nearest CM and 1/4". Modern setups use metric measurements however I have shown both for reference. The above is the official board heights and accepted throwing distance however some leagues may vary so please check your local league setup and rules. As stated the measurement conversion are rounded from the imperial to metric. Over the years the regional variation on ‘Hockey’ or ‘Oche’ length has always been an issue with players moving from one County to another. Throwing distances have been anything from 6’- 9’, most common 7’, 7’2”, 7’6”, 8’ and 9’ So why is the official length 7’ 9 ¼” 2.37m? The answer can be found on the Darts501.com website factoids page. *The East End Fives or Narrow Fives shown here are taken from the East London Darts League show the following dartboard set-up details. The Board should hang securely from a wall so that the height of the centre bull is 5ft 6ins from the floor. The throwing distances can vary from anything from 9ft face of the board measured horizontally. This equates 10ft 6ins when measure from the Centre Bullseye to the rear of the Oche. In 2010 Russ Strobel submitted to the Darts Australia a new recommended dartboard height for Wheelchair users. The height Russ has come up with is 137cm to the centre Bull. The height was based on the perceived origins of the standard hanging height of the standard clock dartboard. It is said the average height of a man in the England UK was 5’8” around 1920’s, the height to the centre bullseye of a standard board. Modern adjustments make that 173cm. Russ has taken this analogy and worked out what the height would be should a man of 5’8” (173cm) be sitting in a wheelchair. His exact figure came out to be 136.5cm however as Russ explains the addition of 0.5cm would make the recommended wheelchair dartboard height easy to remember 137cm (wheelchair) - 173cm (Standard). I agree with you Russ we all like things easy to recall.